And comprehensiveness is what makes Methland not only informative, but satisfying. Rather than limiting himself to any preconceived notions, or simplifying blame to one viewpoint, Reding attempts to paint the wider scene based on his interviews with people and time spent in statistics and newspaper articles. The result feels like a realistic look at the issue, made all the more tangible by the people living the problem. Thus, for those concerned Methland is a bleeding heart liberal account attempting to present meth heads as victims of the system, fear not: the addicts and dealers of Oelwein are portrayed with the same sense of quotidian realism as the police chief and district attorney. Certainly there are criticisms, poverty, human vice, and lack of corporate social responsibility chief among them, but the meth heads are not generally portrayed as helpless in the face of big business. The understanding and sub-text go deeper. 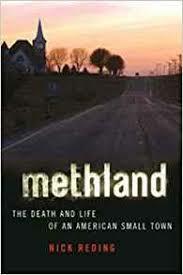 I wanted a relatively comprehensive, palatable perspective on the drug problem in rural America, and in the end, I got it with Methland. Enlightening in numerous ways, not to mention relatable in a human-to-human fashion a lot of faceless journalism does not deliver (save sappy human interest stories), Methland seems an honest attempt to quantify the meth problem and its effect on society from someone who grew up in a small town and is sad to see it impacted to the extent it is. And, if for nothing else, documents the increasing gap between America’s golden years and the present tense, and the people and sectors of society and government involved in the decline.